An important reform of education management and decentralization is in progress. This reform is linked to the introduction of fee-free education in developing countries. School grants are transfered directly to schools by central authorities to allow them some autonomy in using these funds. Some benefits are expected: less bureaucracy and increased administrative efficiency, increased relevance to schools' needs, an improved access to a quality education for all, and reduced disparities between students and schools. This raises the question of the impact of school grants policies. 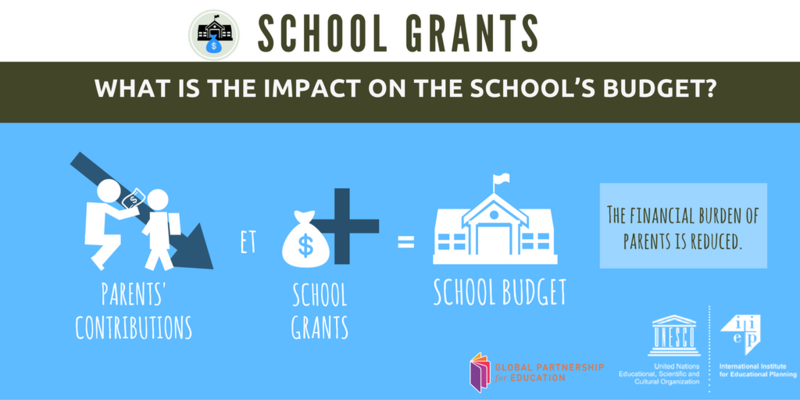 HOW DO EXISTING SCHOOL GRANTS POLICIES CONTRIBUTE TO EQUITY, ACCESS AND QUALITY OF EDUCATION? In order to answer this question, the International Institute of Education Planning (IIEP-UNESCO) coordinated a vast study on the use and usefulness of school grants beginning in 2010. The research program, in partnership with UNICEF covered 4 regions, 14 countries, and 195 schools. For the second stage of the study, IIEP partnered with the Global Partnership for Education (GPE) to integrate two new regions, Latin America and Caribbean, and French Speaking Africa. These research activities are now concluded. To share the results of the research on school grants led in 2015-2016 in four French speaking countries, Haiti, Madagascar, Democratic Republic of the Congo (DRC), and Togo, IIEP organized a policy seminar from October 10th to October 12th, 2016 in Paris. The objective was to learn about the similarities and differencies in policy design in these countries, as well as the challenges and the successes. The seminar allowed for the development of policy recommendations at the national, regional and international levels, which will used to rethink how to design and implement such policies. Examine criteria and mechanisms of grant distribution, use of school grants and decision-making processes at school level. Evaluate the contribution of grants to school access, equity and quality at school level. Identify strategies that will improve design and implementation of school grants policies to contribute to education access, equity and quality. A preparatory workshop was held from October 5th to October 7th 2016 on Improving school financing : The use and usefulness of school grants. This preparatory workshop had two objectives. The first was for IIPE to present a draft of the comparative study on these four francophone countries and to obtain feedback from researchers from the national team. Second, the workshop helped researchers to prepare presentations for the policy seminar on school grants that begun on Monday 10th October 2016. The participants of this seminar were decision-makers from French-speaking African countries and Haiti, representatives of international organizations, development partners, regional and international experts, as members of national teams of the four countries where the research was done. From this program of research, a documentary was made about a school in Madagascar. Here is the trailer. (Click here to watch the documentary in French. English subtitles will be available soon).